The network-ready Canon IR-6055i is ideal for medium to large-sized offices. This multifunction device can deliver a maximum print resolution of 1,200 x 1,200 dpi. The ImageRUNNER IR-6055i multifunction printer also offers good-quality scans, faxes, and copies. The document feeder is optional but the automatic duplexer is standard to the unit. The Canon ImageRUNNER ADVANCE 6055i office black and white printer boasts quick performance and can continuously copy and print up to 9,999 sheets. Wireless LAN is optional. The Canon IR-6055i ImageRUNNER ADVANCE copier comes with a flatbed scanner and features a large touchscreen display on its control panel. It has a standard paper handling capacity of 4,200 sheets but optional trays and finishers such as a booklet maker, stapler, and puncher are offered. Print and copy speed can go as fast as 55 ppm for monochrome. The Canon IR-6055i monochrome laser printer is integrated with 1.5 GB of memory that can be upgraded to 2 GB plus standard 80 GB hard disk drive expandable to 250 GB. 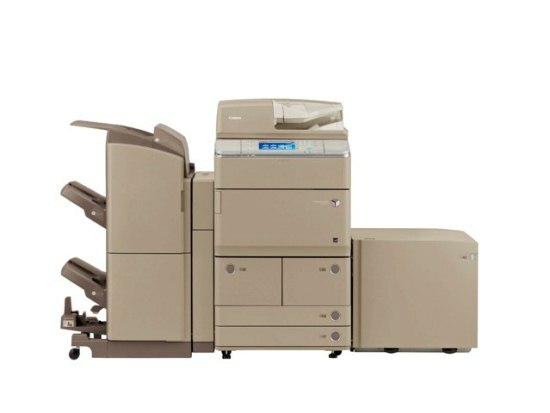 Offices favour the Canon IR6055i black and white copier for its reliability. This robust device has multitasking capabilities and can deliver professional and crisp output. It also has excellent features including a USB host and automatic duplexer. The Canon IR-6055i mono multifunction printer can be easily shared in a workgroup as it is compatible with Macintosh and Windows operating systems and it has built-in Ethernet. Ideal for busy office workgroups, the Canon IR6055i cartridge is packed with black toner for printing up to 56,000 pages. More users could access and use the Canon 6055i ImageRUNNER ADVANCE printer if it had standard Wi-Fi. Expect this multifunction printer to come with a large price tag. Unfortunately, the IR-6055i workgroup laser printer does not allow direct printing from mobile phones or tablets.